James Murabito of Harrison graduates with a Bachelor of Science in Mechanical Engineering degree from Lehigh University in Spring 2018. 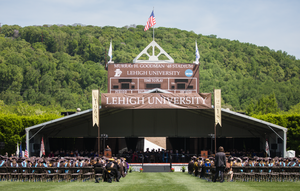 During Commencement ceremonies on May 21, 2018, Lehigh University conferred 1,103 Bachelor's degrees, 402 Master's degrees and 59 Doctoral degrees. Of the more than 1,500 graduates, degree recipients came from 42 states and 53 countries, majoring in 91 different disciplines.